As seen below, the majority of individuals age over the age of 65 have a chronic condition requiring medication, assistance, or both, and can be a major predictor of needing assistance from another individual for daily functionality. What should be noted, however, is that a majority of the senior population have 2 or more of these chronic conditions, with over a third of them having four or more of these conditions; thus requiring greater care and awareness of those living with them or caring for them. 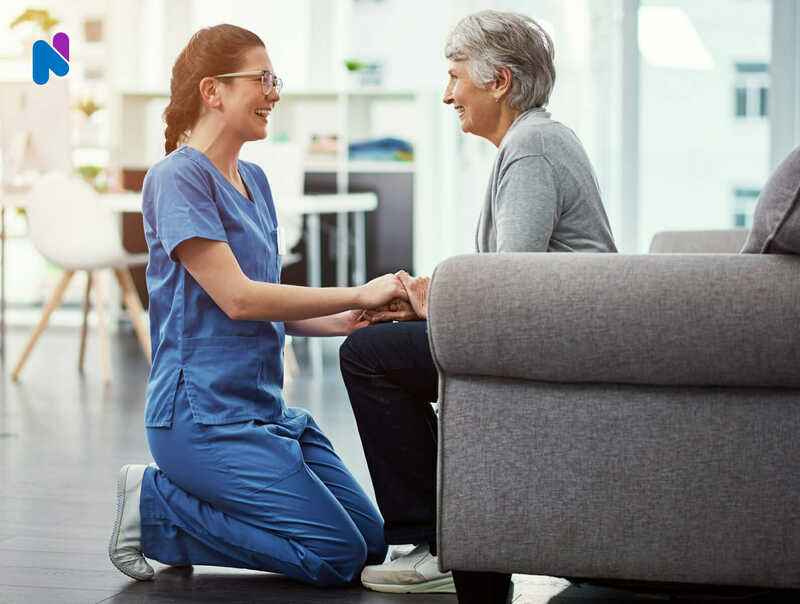 The greatest issue for individuals with six or more chronic conditions is that they may require the assistance and intervention of a Private Duty Nurse more than once per month. As will be seen in the following sections, the number of chronic conditions is a major preceptor in consideration of utilizing nurses for home care of the elderly. Together, ADLs and IADLs represent the skills that people usually need to be able to manage in order to live as independent adults. When the elderly start having limitations of both the number of ADLs and IADLs that can be performed independently, this is a secondary sign of not only needing help from a family caregiver informally, but a sign that more formal training from a Nurse may be required on a daily basis, depending on the limitation. Annually, 8.3 million people receive support from the 5 main long-term care service that nurses provide. Depression and anxiety: Women who are caregivers are more likely than men to develop symptoms of anxiety and depression.24 Anxiety and depression also raise your risk for other health problems, such as heart disease and stroke. Weak immune system: Stressed caregivers may have weaker immune systems than non-caregivers and spend more days sick with the cold or flu.25 A weak immune system can also make vaccines such as flu shots less effective. Also, it may take longer to recover from surgery. Obesity: Stress causes weight gain in more women than men.26 Obesity raises your risk for other health problems, including heart disease, stroke, and diabetes. Higher risk for chronic diseases: High levels of stress, especially when combined with depression, can raise your risk for health problems, such as heart disease, cancer, diabetes, or arthritis. Problems with short-term memory or paying attention:27 Caregivers of spouses with Alzheimer’s disease are at higher risk for problems with short-term memory and focusing. Sundowning: “Sundowner syndrome” — very agitated behavior that becomes more pronounced later in the day — is a common characteristic of those with Alzheimer’s. This can take a heavy toll on caregivers, and when it begins to severely disrupt family routines, this may be a sign that the caregiving burden is too hard to handle. Aggression: Verbal, physical, and even sexual aggression frequently happen in those with dementia, and caregivers and other family members may suffer or begin to feel resentful. When they’re getting to that state, it’s time to start considering placement. At NurseRegistry, we offer wellness checks, medication management, post-hospital care, respite care, and other skilled services. If you have a senior loved one who could benefit from a private duty nurse, visit NurseRegistry.com/private-care or call 650-462-1001 to speak with one of our Care Coordinators. 1 Ortman, J., “An Aging Nation: The Older Population in the United States,” U.S. Census Bureau, May 2014. 5 Kernisan, Leslie, “Activities of Daily Living: What Are ADLs and IADLs?” Caring.com, May 24, 2016. 6 Hwang W, Weller W, Ireys H, Anderson G., “Out of pocket medical spending for care of chronic conditions,” Health Affairs, 2001;20:268-9. 7 Partnership for Solutions. Chronic conditions: making the case for ongoing care, Baltimore: The Johns Hopkins University; 2002. 8 National Center for Health Statistics, The Supplement on Aging to the 1984 National Health Interview Survey, DHHS Pub. no. (PHS)87-1323 (Hyattsville, Md. : NCHS, 1987). 9 Rowland, Diane, “Measuring the Elderly’s Need for Home Care,” Health Affairs, Volume 8, Number 4, 1989, pp. 39-51. 10 Center for Disease Control and Prevention (2013) Long- Term Care Services. 11 Center for American Progress (2007) Caring about Long-Term Care. 12 National Alliance for Caregiving and AARP (2009) Caregiving in the U.S, National Alliance for Caregiving, Washington D.C .
13 Alzheimer’s Association and National Alliance for Caregiving. Families care: Alzheimer’s caregiving in the United States 2004. Washington, DC: Author, 2004. 15 Data based on analysis of data from the 1994 and 1995 National Health Interview Surveys on Disability by Health Policy Institute, Georgetown University. 16 Bucher J, Loscalzo M, Zabora J, et al. +Problem-solving cancer care education for patients and caregivers,” Cancer Practitioner, 2001;9(2):66–70. 17 Scherbring M., “Effect of caregiver perception of preparedness on burden in an oncology population,” Oncology Nursing Forum, 2002;29(6):70–6. 18 Schumacher KL, Stewart BJ, Archbold PG, et al. “Family caregiving skill: Development of the concept,” Research in Nursing Health, 2000;23:191–203. 19 Rose JH, Bowman KF, Kresevic D., “Nurse versus family caregiver perspectives on hospitalized older patients: An exploratory study of agreement at admission and discharge,” Health Community, 2000;12(1):63–80. 20 Given B, Given CW, Stommel M, et al., “Predictors of use of secondary carers used by the elderly following hospital discharge,” Journal of Aging Health, 1994;6(3):353–76. 21 Given C, Stommel M, Given B, et al., “The influence of the cancer patient’s symptoms, functional states on patient’s depression and family caregiver’s reaction and depression,” Health Psychology, 1993;12(4):277–85. 22 Jepson C, McCorkle R, Adler D, et al., “Effects of home care on caregivers’ psychological status,”Journal of Nursing Scholarship, 1999;31(2):115–20. 23 Schulz R, Beach SR., “Caregiving as a risk factor for mortality: The caregiver health effects study,” JAMA, 1999;282:2215–9. 24 Mahoney, R., Regan, C., Katona, C., & Livingston, G, “Anxiety and depression in family caregivers of people with Alzheimer’s disease: the LASER-AD study,” American Journal of Geriatric Psychiatry, 2005, 13(9), 795–801. 25 Godbout, J. P., & Glaser, R. (2006), “Stress-induced immune dysregulation: Implications for wound healing, infectious disease, and cancer,” Journal of Neuroimmune Pharmacology, 2006, 1(4), 421–427. 26 Udo, T., Grilo, C. M., & McKee, S. A. , “Gender differences in the impact of stressful life events on changes in body mass index,” Preventive Medicine, 2004. 27 Vitaliano, P. P., Echeverria, D., Yi, J., Phillips, P. E., Young, H., & Siegler, I. C., “Psychophysiological mediators of caregiver stress and differential cognitive decline,” Psychology and Aging, 2005, 20(3), 402–411. 28 Stevenson, S., “How to Recognize Signs It’s Time for Assisted Living,” A Place for Mom, January 21, 2016. 29 Friedman, S., “Informal Caregivers and the Risk of Nursing Home Admission Among Individuals Enrolled in the Program of All-Inclusive Care for the Elderly,” The Gerontologist, 2006, Volume 46, Issue 4, pp. 456-463. 30 Miller, E. A., & Weissert, W. G., “Predicting elderly people’s risk for nursing home placement, hospitalization, functional impairment, and mortality: A synthesis,” Medical Care Research & Review, 2002, Volume 57 259-297. 31 Pinquart, M. , “Differences Between Caregivers and Noncaregivers in Psychological Health and Physical Health: A Meta-Analysis,” Psychology and Aging, July 2003, Volume 18, Number 2, pp. 250-267.